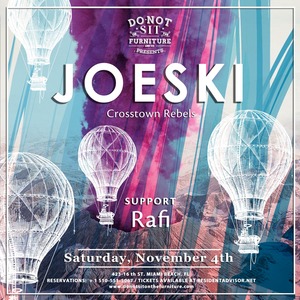 Saturday, November 4th, Do Not Sit On The Furniture presents Joeski [ MAYA Records / Crosstown Rebels/ Poker Flat Recordings] Support from: Rafi V ------------------------------------------------------------------------------ Born in Brooklyn and raised Queens DJ, producer and label owner Joeski has been rocking the house scene since the early 90s. Joeski began his career in the historic NYC club scene where his sound moved the crowd at venues such as Limelight, Tunnel, Palladium and NASA. As a producer Joeski needs no introduction, with hit release on labels such as Defected, Desolat, Poker Flat, Kling Klong and Suara it is safe to say that any proper house DJ has a Joeski track in his set. In the 2000 Joeski started his own label called Maya Records and the idea behind the label was find a home where his friends could express their musical talents as producers. 2015 has proven to the world that Joeski is force to be reckoned with and rest assure that 2016 will continue to showcase that talent.